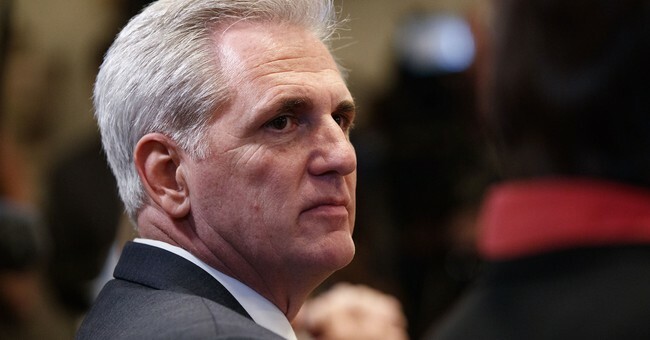 Conservative groups are lashing out at GOP Leader Kevin McCarthy after he took Rep. Jody Hice (R-GA) off of the House Armed Services Committee, concluding that he did so because Hice dared to vote against him in the leadership elections in November. Hice took the rogue route and cast his vote for Rep. Jim Jordan (R-OH) instead. “Removing any member from a committee solely because they voted according to their constituents wishes is viewed very poorly by the general public and is the kind of punishment politics that American people hate,” said House Freedom Caucus Chairman Mark Meadows. A large group of conservatives in the Freedom Caucus also voted against McCarthy in the election, hoping Jim Jordan would prevail. McCarthy won by a vote of 159-43. Tea Party Patriots Citizens Fund Chairman Jenny Beth Martin issued the following statement about Hice's departure from the committee. “The new Congress is not even three weeks old, and House Minority Leader Kevin McCarthy has already broken his word to his colleagues," Martin said. "At the beginning of the 116th Congress, McCarthy told his fellow members, 'We are at our best when we focus not on retribution but on building a more perfect union.’ But just days later, Rep. McCarthy targeted Rep. Jody Hice for retribution by stripping Rep. Hice of his position on the Armed Services Committee in retaliation for Rep. Hice’s decision to cast a vote for his fellow House Freedom Caucus member Jim Jordan to be Republican leader. Tea Party Patriots Citizens Fund endorsed Rep. Hice, and supports all his good work. If Rep. McCarthy cannot honor his own words and steer clear of retribution, then he's not the leader Republicans need to lead them back to the majority. These actions bring division at a time when conservatives and Republicans need to be united - that is, if they don't want to stay in the minority permanently." A handful of conservatives also voted against McCarthy in this month's speakership elections, including Justin Amash (MI), who was booed after casting his vote for Thomas Massie.